We’ve said it before, and we’ll say it again: If you live where there is serious winter, you really need to consider winter tires on your daily driver. Yes, even if you have all-wheel drive. Yes, even if it clearly says “ALL seasons” right there on the receipt from the tire store. It just makes good sense. 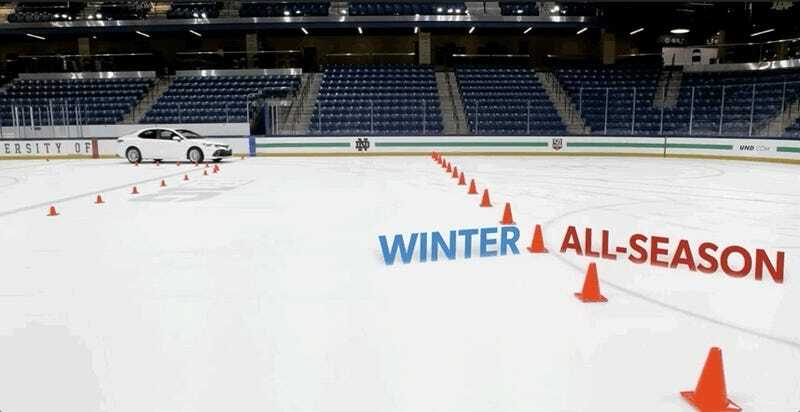 To remind us of what we really should know by know, TireRack.com ran through a series of tests to see just how important winter tires are in icy conditions. The answer: very. Even with traction control and anti-lock brakes, the car without winter tires is all over the place. In a low-speed stopping test, the car without winter boots on slid a full car length further before coming to a stop. As you can see, all-wheel drive can help when you want to get going, but it’s nowhere near as effective when you need to turn, and especially not when you need to stop. Of course, Tire Rack is, indeed, trying to sell more tires. But you can’t really argue with the tape. And when winter is over, get those all-season puppies put on, because winter tires don’t do well on dry pavement.